Ice cream is the theme here – proper Italian ice cream. 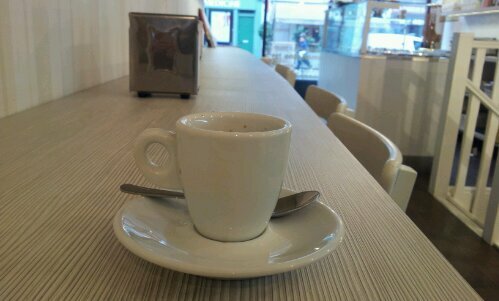 So where better to get a proper Italian espresso too? Italian voices ring around the shop too – this is no ersatz copy, but the real thing. So the coffee is excellent, I am relieved to say. Thick but not syrupy, short but not a smear. Full of rich flavour and textures. And for £1.40, a decent price for somewhere just 5 minutes off Oxford Street. The shop is narrow but has a bench and about 5 high chairs. Downstairs there’s a lot more space, and tables. It looks clean, new and modern – very pleasant. Others: lots of ice cream! Posted on April 17, 2013 by espressolovinPosted in Central London & West EndTagged coffee, ice cream, Italian, London. fantastic place and great staff!